NASA’s ongoing hunt for exoplanets has entered a new phase as NASA officially confirmed that the Transiting Exoplanet Survey Satellite (TESS) is moving into the development phase. This marks a significant step for the TESS mission, which will search the entire sky for planets outside our solar system (a.k.a. exoplanets). Designed as the first all-sky survey, TESS will spend two years of an overall three-year mission searching both hemispheres of the sky for nearby exoplanets. Previous sky surveys with ground-based telescopes have mainly picked out giant exoplanets. In contrast, TESS will examine a large number of small planets around the very brightest stars in the sky. TESS will then record the nearest and brightest main sequence stars hosting transiting exoplanets, which will forever be the most favorable targets for detailed investigations. During the third year of the TESS mission, ground-based astronomical observatories will continue monitoring exoplanets identified by the TESS spacecraft. “During its first two years in orbit, the TESS spacecraft will concentrate its gaze on several hundred thousand specially chosen stars, looking for small dips in their light caused by orbiting planets passing between their host star and us,” said TESS Principal Investigator George Ricker of the Massachusetts Institute of Technology.. Artistic representations of known exoplanets with any possibility to support life. 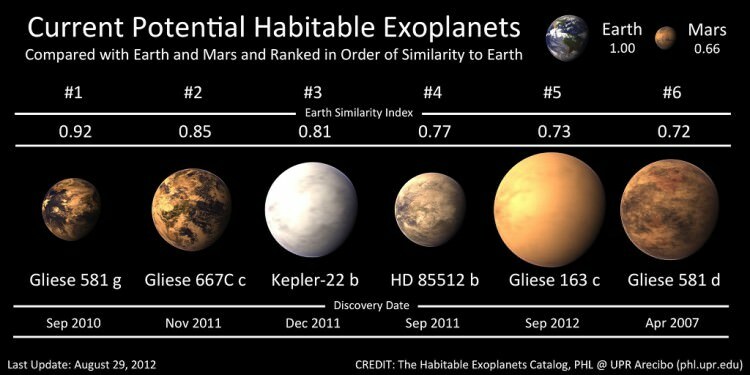 Image Credit: Planetary Habitability Laboratory, University of Puerto Rico, Arecibo. All in all, TESS is expected to find more than 5,000 exoplanet candidates, including 50 Earth-sized planets. It will also find a wide array of exoplanet types, ranging from small, rocky planets to gas giants. Some of these planets could be the right sizes, and orbit at the correct distances from their stars, to potentially support life. Now that NASA has confirmed the development of TESS, the next step is the Critical Design Review, which is scheduled to take place in 2015. This would clear the mission to build the necessary flight hardware for its proposed launch in 2017. TESS is designed to complement several other critical missions in the search for life on other planets. Once TESS finds nearby exoplanets to study and determines their sizes, ground-based observatories and other NASA missions, like the James Webb Space Telescope, would make follow-up observations on the most promising candidates to determine their density and other key properties. By figuring out a planet’s characteristics, like its atmospheric conditions, scientists could determine whether the targeted planet has a habitable environment. TESS will use four cameras to study sections of the sky’s north and south hemispheres, looking for exoplanets. The cameras would cover about 90 percent of the sky by the end of the mission. This makes TESS an ideal follow-up to the Kepler mission, which searches for exoplanets in a fixed area of the sky. Because the TESS mission surveys the entire sky, TESS is expected to find exoplanets much closer to Earth, making them easier for further study. Now that TESS is cleared to move into the next development stage, it can continue towards its goal of being a key part of NASA’s search for life beyond Earth. “I’m still hopeful that in my lifetime, we will discover the existence of life outside of our solar system and I’m excited to be part of a NASA mission that serves as a key stepping stone in that search,” Volosin said. Next PostNext How Does Rosetta’s Comet Compare with Alpine Mountains?